Why is simple so hard??? It’s quite astonishing how most of our tasks are consciously or unconsciously related to ego satisfaction.We tend to keep feeding our ego in numerous ways so that dopamine can be released.We tend to abuse our body, time, wealth etc. just for a tinge of dopamine rush caused by ego satisfaction. It’s weird how we humans always correlate hard work with ego satisfaction.Hard work generally gives us a sense of worth, a sense of usefulness, a sense of accomplishment at a subconscious level.We humans generally tend to appreciate hard work and complexity more to smart work and simple approaches. There was a competition between two best woodcutters of a village,Ram and Shyam, as to who will be the one who will chop the maximum amount of wood in a span of 2 weeks. A poll was conducted before announcing the result just giving out simple stats that Ram used to cut wood for 12 hours each day and Shyam used to cut wood for only 6 hours each day. Most of the people voted that Ram will be the winner, but the results were just the reverse.Shyam used to sharpen his axe for 2 hours each day before cutting the wood. Thus, even though Shyam used to work only for 8 hours a day, 4 hours less/day than Ram, he won the competition. But the expectation of most of the people that Ram will win based on his hard work shows how human psychology asserts more value to hard work even though it might be futile. A kind of similar psychological framework works in the investment world where we simply let go of historically proven profitable strategies, because it's hard for the ego to digest that one can create returns without extensive research and hard work. Saurabh Mukherjea, founder Marcellus Capital proclaimed how even he was skeptical as to how his “Coffee Can Investing” can outperform benchmark indices on a consistent basis, as the strategy is so very simple.The Coffee Can Investing Strategy involves looking for firms that have delivered minimum pre-tax RoCE of 15% or more and sales growth of at least 10% or more over ten consecutive years. For financial services stocks,it seeks to identify firms that have delivered a minimum RoE of 16% and loan book growth of at least 10% or more for ten consecutive years. Back-tests of the framework for each suggest that in 16 out of 17 iterations, the Coffee Can portfolios have comprehensively outperformed the benchmark Sensex index both on an absolute as well as on a risk-adjusted basis. So isn’t it that the extensive hours of hard work fund managers, research analysts and other people in field of stock markets put in, just on a subconscious level to attain a feel of satisfaction that they have worked hard. Similar tricks are played by our mind in daily lives too. For example, compare people who the travel to Vaishno Devi Temple on mules and who walk it to the temple. People who walk it to the temple feel a greater sense of satisfaction because of the extra hard work and the perils they face. Though both the categories, one which travels on the mule and the one which walks it, fulfil the same objective of visiting the temple, finding greater satisfaction levels by the people who walk it is indeed surprising and a subtle play of the ego satisfaction derived by extra efforts. Confirmation bias- (`Confirmation bias, also called confirmatory bias or myside bias, is the tendency to search for, interpret, favor, and recall information in a way that confirms one's preexisting beliefs or hypotheses. It is a type of cognitive bias and a systematic error of inductive reasoning) is directly a by product of ego-satisfaction. We tend to give less weightage to negative news to the stocks we own as its against us ( our ego) and give greater weightage to positive news pertaining to the stocks we own, as it boosts our ego that the analysis of our stock is on point. Disposition effect- (The disposition effect is an anomaly discovered in behavioral finance. It relates to the tendency of investors to sell assets that have increased in value, while keeping assets that have dropped in value.) Its our ego which does not allow us to accept that we are wrong, which in turn leads us to carry losers way longer than we should. Thus,once we get aware about our ego-satisfaction desires and start curbing it, we can maximise our efficiency and utilise our time in the best possible manner. Awareness of the same will help us to understand whether our efforts are actually productive, or are just merely for feeding our mental need of ego-satisfaction. Hence, once investment professionals are able to detach themselves from their ego a lot of behavioral biases will vanish, investment results will improve and most importantly a lot of precious time will be saved from unproductive ego-satisfying activities. In our earlier post on India's real estate sector, we discussed the different cycles that the sector has seen over the past two decades and the structural shifts that are currently underway. Today, we discuss the basic tenets of a Joint development agreement - an avenue of property development opened up by Godrej Properties and later on embraced by the entire industry. Only when the tide goes out is when you discover who has been swimming naked. The widely held belief across investor groups in the country was an illusion that realty prices could never correct. After all, land is a finite resource and demand for real estate is infinite. In a blue sky scenario of perpetually rising prices, it would not take second guessing as to where most of the liquidity in an economy would be stationed. In light of what we have just discussed, it is not difficult to understand why scores of foreign investors have had their apprehensions on the Indian property market for the longest of times. Real Estate in India has historically been a Pandora's box due to the absence of a proper regulatory framework governing the sector at large - anecdotes of home buyers being duped of their hard earned savings by land bank hoarders are in abundant supply wherever one looks. Real Estate is an umbrella term that encompasses different segments namely residential, commercial, hospitality and retail. It forms nearly 8% of the country's GDP and acts as a catalyst to nearly 250 other ancillary industries. Needless to say, any sustained upswing in an economy needs the realty sector to be in the pink of health. Housing and construction have always played critical roles in the economy, with construction now the largest employer in the Indian economy. Progressive and developed nations like the U.S.A. , China, and U.K. are some examples, which demonstrate that no economy has grown sustainably without housing growth. We saw how Indian employment and investment grew significantly on the back of the ‘positive wealth’ effect created by housing growth in 2004-2010. Let's not even for a second, forget the fact that cyclicality is an embedded feature of this sector, not just domestically but on a global level as well. The fortunes of real estate are closely linked to the overall macroeconomic scenario across borders - which in turn is a culmination of several other moving parts - interest rates, fiscal policies, so and so forth. A sample of all real estate companies in India as complied by Ace Equity adds impetus to our observation - Return on Capital Employed slid from a dizzying twenty seven percent in FY'95 to a lowly six percent by FY'04! In tandem, net per-tax margins slipped a whooping 90% from their highs in 1996! Relaxation of FDI Norms in 2005 promulgated the sector to a wide global audience of investors for whom this market provided a direct avenue to participate in the growth story of the economy at large. Incumbents as well as newly established ventures lapped up the influx of foreign money as a bountiful source of capital to spur activity in the sector. The Indian market though, was just another beneficiary of the global rally in property prices which eventually culminated with the onset of the subprime crisis in the United States. It is an anomaly when companies who are growing profits at triple digit rates are compelled to tap external sources of funding to fuel growth. Taking a sample of listed real estate companies for the period between 2003 and 2007, what we found was that despite supernormal growth in profitability, cumulative debt equity ratio increased from 1.02x in FY'03 to 1.31x in FY'07 - an absolute increase of more than fifty thousand crores! Cumulative Cash from operations for the selected period was a mirror image of cumulative EBITDA! The "amplification mechanisms", whereby, a large increase in asset price is followed by a higher demand, as investors think that further increases in prices will follow. This "super-exponential" acceleration in prices due to a positive feedback (or "pro-cyclicality") leads to formation and then maturation of a bubble, which has happened in case of the Real Estate prices in India. An opportunity size catering to 125 crore Indians, growing in double digits is a lucrative proposition for a swarm of new companies wanting to have a bite of the cherry. And if you add a painful slowdown in off-take, what you get is the prefect recipe for a financial disaster in the making. A complete absence of checks and balances at various stages of real estate development have for long been hunting grounds for several fly by night developers who have relied on the money of home buyers to accentuate other ventures.This eventually translated itself into a fragmented sector wherein no single player would have a definite command over his/her area of competence. 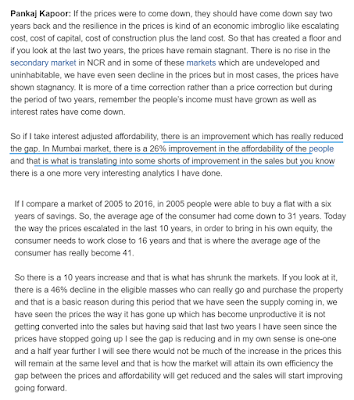 In an interview to BloombergQuint, Mohnish Pabrai succinctly talked about a trilogy of events that have shaken the Indian property market over the last eighteen months - Demonitization, followed by the double whammy of RERA and GST. Let us understand the three events in greater detail. According to Liases Foras, a real estate consultancy, about thirty percent of all property transactions have traditionally been transacted in hard illicit cash - most of which emanates due to the stark difference between circle rates and market rates. By under-reporting transaction prices, the buyer benefits as he has to pay lower municipal taxes on his purchase and the seller benefits by way of a lower outflow of capital gains tax on the sale of his land. A blanket ban on 500 and 1000 denominated currency notes bought the entire sector to a grinding standstill. The impact of this move was profound as transactions in markets such as the Mumbai Metropolitan Region( MMR) and the Delhi-NCR region (where a sizeable chunk of overall demand originates from speculators who want to make a quick buck by betting on price increases during the construction phase of a project) took a significant hit . The first of the trilogy of moves well and truly separated the wheat from the chaff. Developers who relied on this channel of funding for augmenting their business were almost wiped out of the game overnight as the component of liquid cash was no-longer a bankable source of capital to tap into. Real estate development was slowly graduating from being one of uncouth practices and opaqueness to a consumer centric and transparent business model. After being in the works for several years and governments, the real estate regulatory act(RERA) was finally adopted in the summer of 2017. The provisions contained within the bill were remnants of a cleanup drive that would completely reboot the sector at large. Indeed, the onset of RERA after the bombshell of demonetization has pegged the entire sector back to square one. As weak hands run for cover, fresh supply into the market has taken a beating and speculative demand as a whole has found alternate sources to deploy capital. Having dealt with the aspect of trust with the onset of the RERA, let us now understand whether prices are really conducive for home buyers as of date. Low mortgage rates, combined with a time correction in prices points towards a multiplier effect in terms of affordability for the home buyer thereby pointing to meaningfully higher sales velocity. This shortfall in cash flows would entail latent demand for working capital by way of construction finance - thereby creating a natural barrier to entry. The flip-side of lower sales visibility at the commencement of a project would however propel an element of uncertainty as completed projects may or may not witness traction in off-take as demand is a cyclical element of economics. 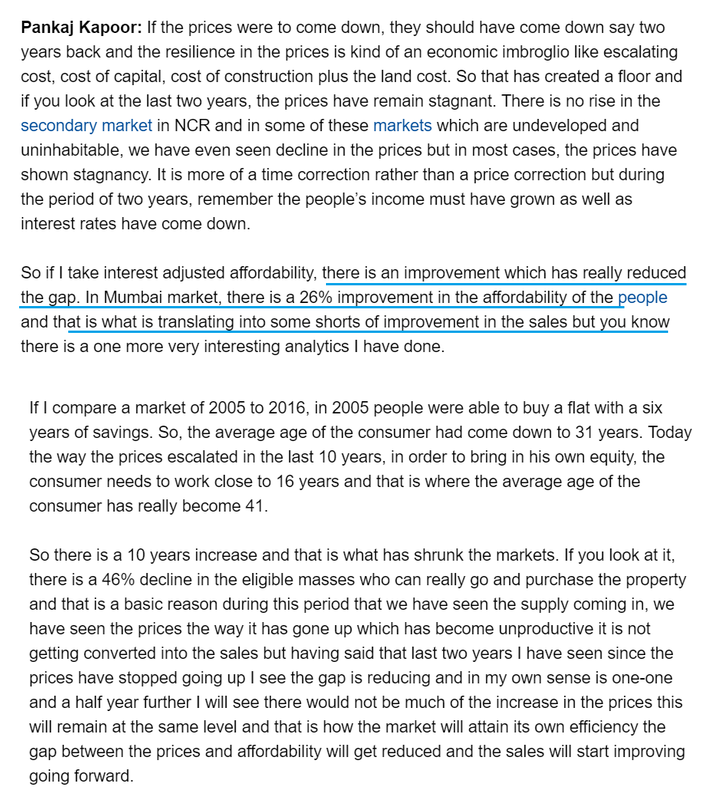 Talking in terms of profitability, exorbitant property price rises fueled by speculative demand are a thing of the past - which would mean that a big part of the abnormal margins that accrued for real estate companies during the cycle of 2008 will take a backseat. The forthcoming up-turn in the industry shall typically be led by higher turnover ratios (a big reason for this is the demand emerging from affordable housing) , stable profitability and relatively lower levels of leverage. Banking is a treacherous yet lucrative business and there are institutions and people across global economies who have borne testimony to both sides of the coin. There are inherent similarities between what a bank does and what a trader does - both make money from money, earning the middleman's commission in the process. The Indian banking fraternity has traditionally been the fortress of State owned enterprises who have held the lion's share of the market. Prior to 1991, PSU Banks accounted for 91% of the total assets in the system as they faced little by way of external competition. As the government and the RBI have opened up the sector over the years, incumbents have lost out on the incremental opportunity on a consistent basis thereby ceding ground to the more nimble and efficient private players. These slippages have had a direct rub-off effect on the P&L's as incremental slippages leads to incremental provisioning that banks have to carry out against them. This in turn has depleted profitability for state owned banks. Growth Banking needs growth capital and one of the primary sources of growth capital for a bank is the re-investment of its profits into business so as to augment balance sheet leverage. The cumulative capital raised by the constituents of the Nifty PSU Bank Index has been to the tune of approximately 42300 crores. This has primarily served as a buffer against the incremental provisioning that has plagued profits, leaving little room to grow the business. The government's decision to infuse a mammoth two lakh crores into its banks to recapitalize balance sheets has been well received by the corporate and the investment fraternity alike. Addition of approximately two lakh crores would mean that the total equity would now go upto nearly six and a half lakh crores. With enhanced Tier 1 ratios, bank managements would have the luxury of throwing in the kitchen sink of provisions and expanding balance sheet leverage to revive capital formation in the economy. Let us first explain the part on provisioning.. Resolution of these large cases would then dictate the quantum of write-offs that banks would have to further take on them. Subsequent to the provisioning, banks would then have the remainder of the recap money available for re-investment in the form of growth capital. Wealth Creation in banking has been a direct function of two key features - a vibrant corporate culture and strong credit under-writing. It is the combination of these two factors that has led to creation of brands like HDFC in a business which sells plain vanilla commodity products. Public sector banks have for long been at the receiving end of following substandard appraisal processes, leading to significant erosion of equity over the years. The bank recap plan should go a long way in healing near term stress - but, will the nightmare of the past decade make these organizations leaner for the future? Only time will tell.